It starts with Gust and Sand-Attack. One does minimal damage (and is not a Flying type move like it is in later generations) and the other reduces Accuracy, which is very annoying to fight against, but generally not worth your time fighting with. It eventually gains Quick Attack, which is an improvement over Gust in that you'll always attack first with it, but is still very weak. It picks up Whirlwind and Mirror Move along the way, two moves that are generally useless--Whirlwind does absolutely NOTHING in battle (again, only in this generation, it was improved a bit later on), while Mirror Move just copies whatever your opponent did last. Ugh. In between these two gems, Pidgeotto learns Wing Attack (whose base power was amped after this generation) and Agility, which is really the only good move of the bunch. 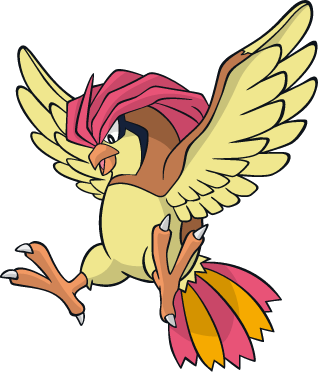 It doesn't take a genius to see that since nearly half of Pidgeotto's moves were improved in later generations, it must not have been very good in THIS generation. And it's not. But it does have a saving grace--I still have a soft spot for 'geotto since it WAS the first Pokemon I ever caught, and despite being a pigeon, which does not taste very good, it looks like a turkey, which is delicious. I'm assuming Pidgey tastes how it looks, which means comes Thanksgiving I'm catching a whole bunch of 'em.